Deer Valley Unified School District Saves Millions on Energy! The Deer Valley Unified School District (DVUSD) received a check this week for over $30,000 from Arizona Public Service (APS) for their utility management program. With this check, savings for the district in rebates alone are millions of dollars since they started the program with the help of Valley Schools Management Group (VSMG). The rebates are a partial reimbursement for DVUSD taking the initiative to install more energy efficient equipment after an extensive review of campuses. Not only has their been millions in rebates, but the utility savings are also staggering. Jim Migliorino, the Associate Superintendent for Fiscal Services at DVUSD has helped spearhead this effort to reduce costs. Working closely with John Brunell and Tim O’Brien of VSMG, Jim has retro-fitted and replaced equipment in circumstances where the cost of the upgrade is more than offset with utility savings and APS rebates. It is an uncommon event to see such dedication to saving money for a school district so that precious tax dollars can go into the classroom, not to pay for excess utility costs. 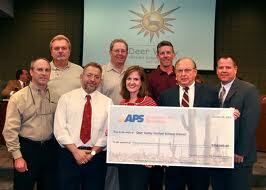 One of many checks earned by DVUSD from APS as a result of their efforts. More to come in future posts on details as to how these significant savings were realized. This is clearly the road for public and private organizations to take. Pure bottom line profit while helping the environment!